Mill Ridge Farm sees success from UK Pasture Evaluation Program. Video by Jeff Franklin/UK Ag Communications. 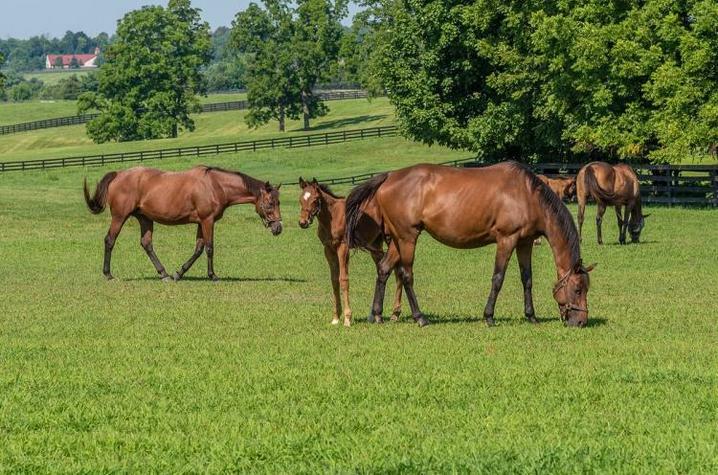 LEXINGTON, Ky. (Aug. 27, 2018) — A Kentucky thoroughbred horse farm is reaping the benefits of healthier mares and foals due to pasture renovations they made over the past year with guidance from personnel in the University of Kentucky College of Agriculture, Food and Environment. In 2017, Mill Ridge Farm in Lexington experienced significant foaling problems that appeared to Marc Richardson, the farm manager, to be classic symptoms of fescue toxicity. Under the advisement of the farm’s veterinarian Dr. Stuart Brown, Richardson contacted UK forage extension specialist Jimmy Henning and Krista Lea, program coordinator for UK’s Horse Pasture Evaluation Program. Henning and Lea met with the farm personnel at Mill Ridge. They took forage samples from pastures frequented by pregnant mares. The samples were analyzed, and the results confirmed that the tall fescue in some of the farm’s pastures had high ergovaline levels. Ergovaline is a toxin produced by endophyte-infected tall fescue that affects pregnant broodmares. Henning and Lea made recommendations that included completely killing off two fields with the highest ergovaline levels and reseeding them with bluegrass, orchardgrass and a little perennial ryegrass to help with forage establishment. This meant taking those two fields out of production for almost a year. They removed only the fescue in the other fields. Richardson and other Mill Ridge personnel have been pleased with the results. Richardson said the farm plans to renovate one field each year until they remove fescue from all the fields through which pregnant mares rotate. “It’s a big investment, especially the pastures we totally killed off and reseeded, but when you compare it to the cost of one trip to the clinic with a mare and foal or the loss of a foal, it’s not really very expensive,” he said. Horse farm owners and managers who are interested in learning more about pasture evaluation should start with their county extension agent for basic recommendations and help in taking soil samples. They can get more detailed recommendations and samplings through UK’s Horse Pasture Evaluation Program. Mill Ridge Farm, Lexington. Photo by Jimmy Henning, UK forage extension specialist.